Portrush travelled to Belfast in a Linden Cup Pool match and were well beaten by a slick Cambellians outfit. After conceding an early scrappy goal, Portrush settled down and for about a 15 min spell in the first half, Portrush played good hockey and were the better team. They had two or three real good sights at the Campbellian goal, but a combination of good keeping and poor finishing, Portrush could not find the net. But Portrush had Campbellians rattled and their lack of discipline saw Campbellians have three players sinned binned at different times in the first half. However, Portrush could not make their numerical advantage count. As the first half drew to a close, Campbellians broke with pace and slick movement and scored 2 quick goals. Into the 2nd half and Portrush did not carry the same threat, and with Campbellians constantly rolling on and off subs they scored three more goals, although two of them very dubious, especially a penalty flick, which never was. Portrush can take plenty of positives from the match. Campbellians will be one of the strongest teams in a our league, and for large parts of the 1st half we were more than competitive. Craig Henry in the midfield was as energetic and combativtie as anyone else on the pitch, Barry McMullan worked tirelessly upfront, and John Dillon always carrys a threat going forward. Newly promoted to Division 4, Portrush 2s Captain led a much changed side from that of the one to finish third in the league and lost on the 17th penalty of the Junior Cup final. With Injuries, family commitments and being forced to play at the same time as the first eleven, Hogg used his renowned powers of persuasion to coax out of retirement such legends of the club as David Price and Frank Shirley to assist him in leading an exceptionally young team with five debutants, including 15 year old Jamie Kane between the posts. With only 11 players in the squad, Portrush started the game well penetrating the Campbellians circle a number of times in the first few minutes only to be denied by an experienced Campbellians defence. This was to set the tone of the first half, as The Ports young midfield of Hogg, McAllister, Kane and Morrison toiled against the Campbellians defence providing the attacking force of Shirley and Holmes numerous chances. Consistent pressure from the centre forwards and a fine piece of passing from the midfield broke the deadlock, through a well taken goal for debutant Steven Morrison, around the half hour mark. The Belfast side then pilled on the ever tiring legs of The Ports defence using their midfield to crash the ball from outside the circle in the hope for a deflection. This produced a brace short corners for the Belfast side in quick succession. Jamie Kane, playing in his first senior game for the club, pulled off a series of ever increasingly impressive reaction saves to keep the score in the Ports favour. Unfortunately, at the stroke of half time Campbellians levelled the score through a powerfully struck short corner that would have troubled both keepers on other pitch playing for their senior elevens. The second half started off much as the first had been with The Ports feeling refreshed from the short break and inspiring words from skipper Hogg. This lead to a number of early attacks on the home side goal. It wasn’t until just after the 40th minute that a break from midfield and tight, quick passing from the centre forwards opened up an opportunity for Steven Morrison to double his score tally and move The Ports once again into the lead. This was to be the high point as the Belfast side used their subs bench to maximum effect, rotating their young squad regularly to wear down the fatiguing Portrush midfield and defence. The defence, lead by the experienced head of David Price, resisted wave after wave of attack by the home side as they overloaded the final quarter of the park. John McMullan, Josh Hutchinson and young keeper Kane performed well despite regularly being outnumbered by green shirts. The untiring push forward and use of crashing balls in from outside the Portrush Circle lead to the Belfast side dominating much of the rest of the half. Campbellians levelled the score through a well struck ball that narrowly defeated the outstretched Kane via a number of ricochets from both teams’ sticks. This was followed up by a contentious short corner, which took the home side into the lead for the first time through a vicious drag flick that neither keeper nor defence could do much about. The, by now visibly tired, Ports kept up the fight with a number of breaks that gave the opposition defence and keeper many a test. With Steven Morrison digging deep into his reserves of energy to run through the defence seemingly at will, narrowly missing out on more than half a dozen times. 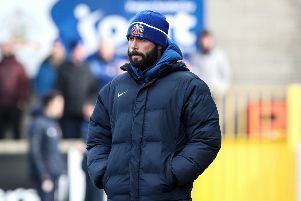 Despite the breaks, The Ports defence succumbed to the Belfast side’s ability to use their substitutes and rotate their midfield and forwards to apply pressure for longer periods than The Ports defence could sustain, leading to two more goals coming from ricochets of crashed balls giving debutant Kane little or no chance in goals. The final ten minutes only served to make the score line unfairly represent the game, with two further goals coming from Campbellians use of pace to get round The Ports defence and overload the already overworked defensive line to run out eventual 6-2 winners. Skipper Hogg will take great heart in the knowledge that with a number of senior players returning in the next few weeks and the influx of younger players proving themselves more than capable of competing at this level, future games will not flatter the opposition in quite the same light. In particular note was the impressive display of the four teenage debutants Steven Morrison, Mark McAllister, Stephen Kane and Jamie Kane. The younger of the two Kane brothers, Jamie, excelling in the goals and undoubtable a talent for the future.